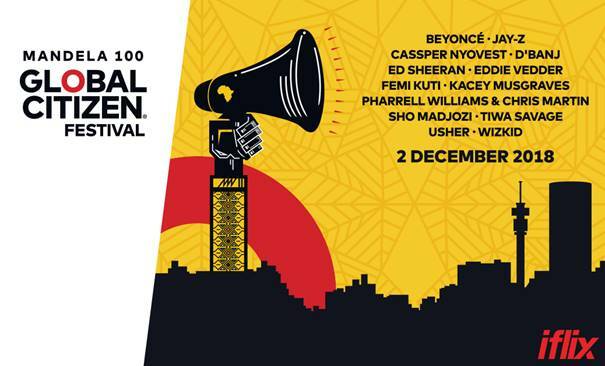 iflix, the world’s leading entertainment service for emerging markets, and international advocacy organisation, Global Citizen,today announced that iflix will be a broadcast partner for the Global Citizen Festival: Mandela 100, which will take place on Sunday, 2 December 2018 at the FNB Stadium in Johannesburg, South Africa. iflix will bring the festival to fans in 13 countries and territories including Indonesia, Malaysia, Philippines, Thailand, Vietnam, Bangladesh, Pakistan, Cambodia, Sri Lanka, Nepal, Brunei, Myanmar and the Maldives. The collective reach of the broadcast partners will deliver the largest reach of any television broadcast of a Global Citizen event to date. Leaders set to address the Global Citizen Festival: Mandela 100, include South African President Cyril Ramaphosa, Amina J. Mohammed, Deputy Secretary-General of the United Nations, Prime Minister Erna Solberg of Norway and President Nana Akufo-Addo of Ghana, who both serve as co-chairs of the UN Secretary General’s Advocacy Group for the Sustainable Development Goals, President Mokgweetsi Masisi of Botswana, President Paul Kagame of Rwanda, chair of the African Union; President Uhuru Kenyatta of Kenya; His Excellency Benedict Bengioushuye Ayade, Governor of Cross River State, Nigeria; Mrs. Graca Machel, UN Sustainable Development Goals Advocate; The Rt Hon Patricia Scotland QC, Secretary-General of the Commonwealth; Dr. Jim Kim, President of the World Bank; Phumzile Mlambo-Ngcuka, United Nations Under-Secretary General and Executive Director of UN Women; and Ambassador Deborah Birx, U.S. Global AIDS Coordinator & U.S. Special Representative for Global Health Diplomacy; Dr. Tedros Adhanom Ghebreyesus, Director-General of the World Health Organization, Alexander De Croo, Deputy Prime Minister of Belgium, David Beasley, Executive Director of the World Food Programme, Ambassador Ertharin Cousin, Board Director of The Power of Nutrition, and Peter Sands, Executive Director of the The Global Fund to Fight AIDS, Tuberculosis and Malaria. Global Citizens have generated commitments and policy announcements from leaders valued at over R544 billion (USD37.9 billion) that are set to affect the lives of more than 2.25 billion people. This year alone Global Citizens have secured 29 commitments totalling over R108.2 billion (USD7.6 billion) that are set to affect the lives of more than 501 million people by 2030.